With the New Year well and truly underway, your thoughts are likely to turn to what the next 12 months will bring. Your achievements and success comes mainly down to two questions - what are your goals for 2018? How are you going to achieve them? Keep it simple - keep the number of goals to a minimum. Between 3 and 5, any more and you may become overwhelmed! Don’t just make them about your career or business. Setting goals for your family and personally can have major benefits for you. Specific – be clear in your goals, if your goal is to increase turnover, then by how much? Achievable – if your current turnover is £100k don’t set an unrealistic target of £20m in 12 months. Time-bound – when do you want to achieve the goals by? Do something everyday that helps you to achieve your goals, no matter how small. Hopefully the above will help you on your way to creating your goals for 2018 and getting the best out of the next 12 months. 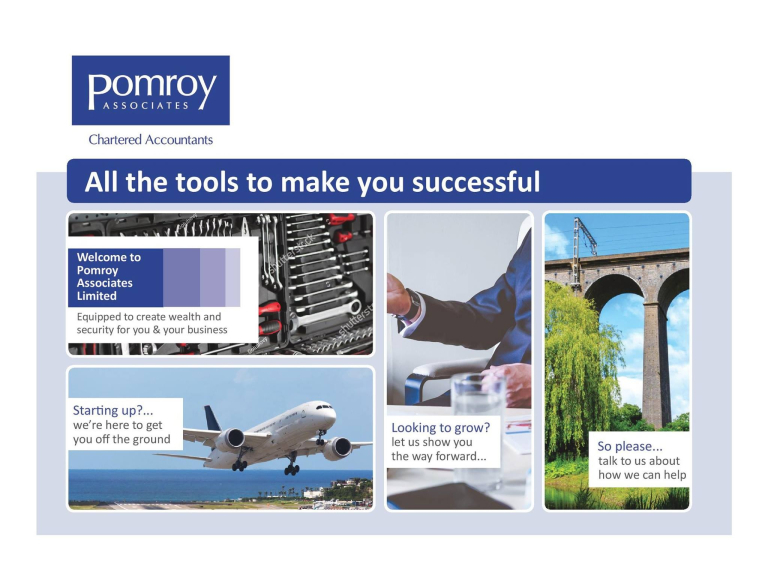 If you would like some help with your targets, learn more about setting KPIs or help with forecasting and budgeting for your business then please don’t hesitate to contact Pomroy Associates Limited. Pomroy Associates Limited is an independent firm of Chartered Accountants in Welwyn Garden City, Hertfordshire providing personal and professional accountancy services.